Success and a perceived advantage will nearly always promote envy. Not from all. But always from some. The person feeling envy can be a friend, a virtual friend (social media only) a colleague or—for the purposes of this blog—a patient. In fact dentistry is rife with enviers. It provides the fuel for so much of the interpersonal acrimony and vociferous negativity I see every day on online feeds. Some Facebook threads are looked at by so many others, it’s akin to hearing there will be a hanging in the public square at noon. The crowds, rather macabrely, flock to watch two dentists fight with words over some irrelevant nonsense. Envy can even manifest as an attempt to point out inconsistencies in our work, flaws in our character or holes in our reputation. Even an historical opinion, even when we know it has now evolved to something new, may be highlighted and waved in front of us as evidence of our hypocrisy. Dentistry has a problem with this which is best avoided by never seeking applause and other forms of external validation, and by, instead, simply taking pride in your work and the health, wellbeing and quality service you are able to provide to others, i.e. your patients. Achieving this alone offers a wonderful sense of internal satisfaction and long-term contentment; whereas being dependent on the likes, clicks and hearts of others is extremely attractive at first but can quickly make you addicted to the dopamine released every time it happens. How often do you check your phone even when it is silent, dormant, and yet…just in case, just maybe, there is some love on there for you? Sure, share your ideas as teaching opportunities, if it is right to do so; but think again before sharing the huge volume of high-profit work you do, your cars, your glowing surgery, your trophy partner, etc. Put patient wellbeing first. Hang your hat on it in the long-term. The bigger problem can occur when your patient becomes the envier. Envy, as defined by Parrot in The Journal of Personality and Social Psychology, “occurs when a person lacks another’s superior quality, achievement, or possession and either desires it or wishes that the other lacked it”. More simply, Aristotle defined envy as pain at the sight of another’s good fortune, stirred by “those who have what we ought to have”. The strength of feeling is on a spectrum. It is perfectly reasonable to envy another person’s youthful athleticism, good looks and/or financial wealth. Those feelings are quite normal and can be used as a fuel for good—your envy may guide you to who you admire and help you set some personal goals. I’m envious of Harry Kane’s weekly income, but I don’t dwell on it; any envy is fleeting, trivial and, if anything, inspires me to work smartly and maybe try to achieve more in my own life. Benign envy. Working in a hospital department with dodgy air conditioning, 20-year-old paint on the walls, and no money to maintain the equipment, I feel vague pulses of envy when I see colleagues with their stunning surgeries, under-lighting on the bracket table and all the newest tools of our trade. But again, it’s just a moment, and somehow I feel proud that we can achieve all we do without the glitz and glamour. I feel a mild, benign envy. Nevertheless, all we have experienced so far is benign envy. You will meet many patients who feel and perhaps express benign envy. You are probably clever and looking forward to a rewarding career with plenty of respect from most you meet. Who wouldn’t envy that? The trouble arrives when your patient feels malicious envy. Have no doubt, some will, some do. 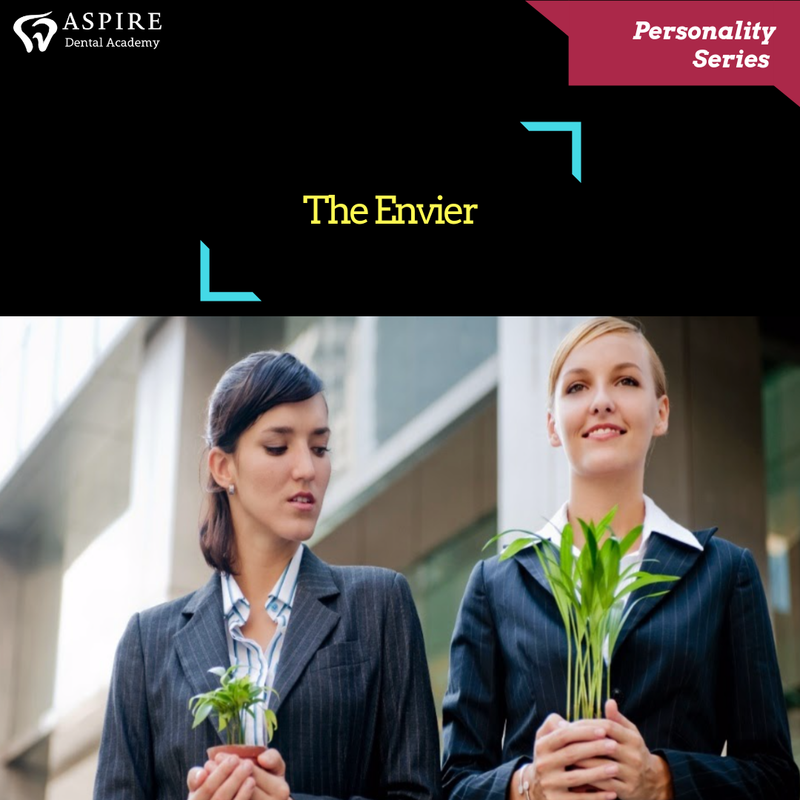 Malicious envy is much worse and can mean patients act to cause you emotional or professional harm. I’ve counselled so many lovely dentists who have been torn to pieces by an envious patient. They have laid clinical traps for them then turned on the dentist to discredit their professional status. They have tried to score points back by writing completely fictitious Google reviews and made complaints from spurious points of view that are absurd. I’ve had this happen to me. Several times, actually. The first was from a geriatric denture patient who took an envy-fuelled dislike to me when I was six months’ qualified and doing what we then called vocational training. He had a complete denture and blamed me—despite the fact I had never met him before—for it not functioning as well as natural teeth. He complained, despite me listening and reasonably discussing the situation with him. It seemed the nicer I was, the more his ire grew. The truth only became apparent after he stormed out and made a complaint that I had threatened him after he shouted (I hadn’t). Later that week he was trying to befriend some young ladies in a local pub and proudly told them he was trying to “cause some trouble for the new, good-looking dentist up the road who thinks he’s James Bloody Bond”. The young ladies were my sisters, who had come to visit me as I was living in a new town and hadn’t made many friends yet. As a younger man, I wasn’t too bad on the eye and that set this chap off. Envy. Malicious envy. The risks for inducing a reaction like this are easy and endless to list: your looks, your youth, your brain, your manner, your popularity, your love life, your car, your success, your responsibility. They may be envious of falsities. I’ve been told that “You’ve only got where you are as you had such a privileged education, so it’s been easy for people like you.” (I went to the local primary school and then a state-run comprehensive, BTW. My education cost my parents £0.00). The envier’s particular source of ire is likely specific to them and hence specific to you. A fully qualified dentist at 24 will meet many patients who have achieved a less significant professional accolade but are many years their senior. Will they be envious? Well, maybe. Maybe. It depends. Most won’t be envious of our job—staring into other people’s gobs all day is hardly glamorous. But maybe. Maybe they are. Maybe they are envious of your teeth, for goodness sake. The problem here is our actual confusion as to the source and reason for this attack. What we must realise is that this is not about truth or real debate, but actually stems from pure unadulterated envy, under the disguise of righteous criticism. People may register for care by your hand with an undercurrent of resentment in our having more success than they have. They secretly desire the opportunity to take us down a notch; they have a nose for any misstep on our part they can exploit. Humans are naturally prone to feel envy; it comes from our perpetual need to compare our status to others. And among those who are particularly insecure, envy can motivate a great deal of their behaviour. But in the real world, enviers have to be careful — in attacking possibly strong people in public they can pay a price, and if the discrepancy between attacker and target is too obvious, envy as the root of the attack can be too easily discerned and prove embarrassing ; it is an ugly emotion to display. When the beloved GDC stacks the legal cards so very heavily in patients’ favour and the medico-legal scene casts you as the villain and is an utterly one-way street, well, the game is different. It is often hard to gauge the relative status of the person attacking us, and so it is harder to see envy as the source. Not only are there no consequences to pay for attacking dentists, secret enviers can gain all kinds of attention in doing so, even making a name for themselves. Sadly, they may, on occasion, find their attacks seconded by a mob of fellow enviers who relish the chance to take down someone ‘lucky’. Understanding that envy is at the root of the attack, we can find it easier to control our emotions and quell any sense of self-doubt or guilt we might have. We understand enviers are dangerous and usually not worth wrestling with; they have less to lose than us because…well, they have less than us. Only, if they are causing actual damage to our name, we can choose to defend ourselves in a polite, and cold manner — pointing out the irrationality of their reasoning, and leaving this as our last word on the matter. If necessary, we can always appear contrite, agree nominally with them, and display some self-deprecating humour, calming and neutralizing their envy. In any event, awareness of what is actually going on is the key to having such options. Self-deprecating humour, if sincere, is always a good area to have practised. Show you’re fallible and flawed, and that it’s funny. An envious patient can usually find their negativity towards us evaporating like mist in less than a moment if they see you as a fellow traveller in this world with all of the anxieties, fears and worries that we all have. That, aside from your role as a dental professional, you are a human who sleeps, cries, needs holidays and wants to be liked and loved like everyone else. Your strategy should be to find the source of their envy and disarm it. Build mutual links with the patient and expand on these areas in common. There will be some, I promise. Ask them open questions about themselves, their lives, their own journey. Make yourself be interested. Affirm and understand their words. Don’t talk to listen, talk to understand. Use your soft skills!!! The open question strategy can be vital for unpacking the secret envier’s mind. A. Yes or No. No help to you there. A. Well…I usually don’t mind it but…. Now we can expand on that and move on. Listen to them and use lots of non-confrontational open questions. The truth will out. Once they see you for you, and I do mean the real you, the envy will go. Well, unless you are a complete tool, in which case you’ll rub their faces in it and you deserve everything that’s coming your way. Enjoy!